This is the first in a series highlighting Native CDFI leaders and funders. Over the years, we’ve been honored to fund and work alongside Native CDFIs. NACDC Financial Services is one of them. 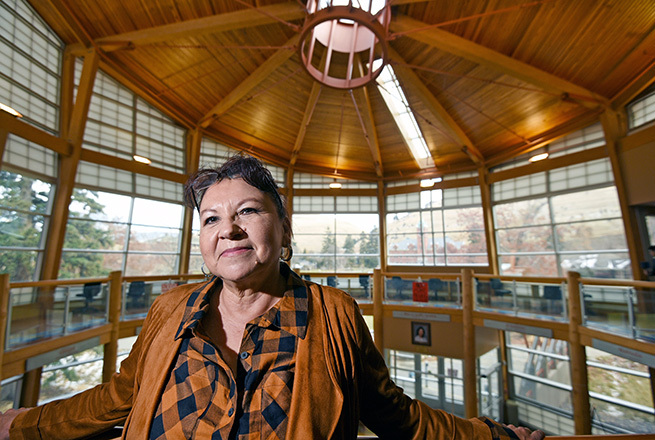 Based in Browning, MT, on the Blackfeet Indian Reservation, NACDC Financial Services offers a range of supportive products and workshops designed to help Native entrepreneurs succeed. We caught up with Angie Main, NACDC Financial Services’ executive director, who participated as a panelist in the Nov. 10 event in Missoula. Main shared the history of NACDC Financial Services to illustrate how Native CDFIs are growing jobs, innovating, and supporting entrepreneurship in Native communities. “[One of] the exciting projects we’re currently involved in is homeownership. . . . We went from credit builders to small business loans, consumer loans, ag [agriculture] loans, Native artist loans . . . and now we’re doing the homeownership loans! “Just recently, we funded a home for a couple on the Fort Belknap Agency in Montana. They have two little girls so they bought a fair-sized house that they’re going to enjoy for probably the rest of their lives. “Last year we did a total of 31 trainings across six reservations; we had 589 participants in total in all of our trainings. I think we did two homeownership ones, the rest were small business, credit builders, Native artists, and [six] ag loans [mostly for livestock and feed]. NACDC Financial Services’ growth spurt is happening at a time when investment and homeownership in Indian Country is rising. That economic growth has led to high capital demands that the organization is trying to meet. A 2017 survey, led by the Center for Indian Country Development at the Federal Reserve Bank of Minneapolis, shows that as Native economies grow, Native CDFIs across the country are also facing high capital demands. The survey noted that in 2017 alone, the additional amount needed to meet funding needs was about $48 million. Main responds by focusing on expanding her investor portfolio and building new relationships with funders—one of which is the Kendeda Fund. Kendeda Fund provided a multiyear grant to NACDC Financial Services, which Main said was critical at a time when they had significant pending loans. NACDC Financial Services represents many other Native CDFIs—they build assets in Native communities and they’re poised to grow even more with the right funding opportunities. Want to learn more about NACDC Financial Services, Native CDFIs, or how to partner with them? After a recent survey, we learned you were just as inspired by Native CDFIs as we are. That’s why we’ll continue to bring you more stories like this.